In my career as a editorial photographer, this has so far been my most ‘Boys Own’ job – spending the day at White Waltham airfield surrounded by aircraft, and in the company of walking-Wikipedia. 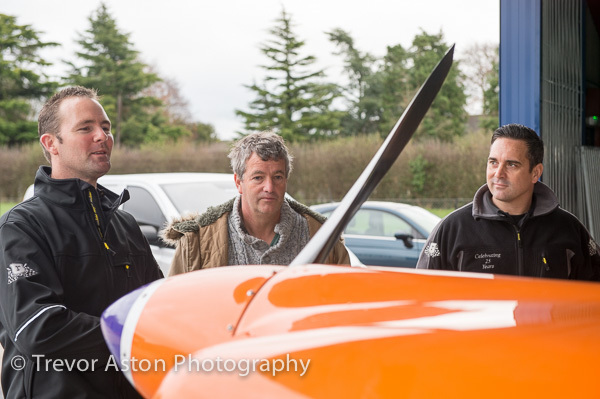 Philip and Colin, who know about cars and aeroplanes, and two expert ‘detailers’. Sadly, the photography was not to involve taking to the air or driving cars. We were here to watch the ‘detailers’ cleaning a plane, so more ‘Widow Twanky’ than ‘Biggles’. 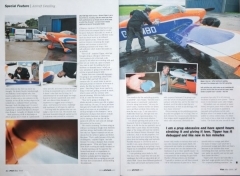 Pilot magazine editor, Philip Whiteman had got me there with writer Colin Goodwin. Colin was writing an article how to get your aeroplane clean. The grubby flying machine in need of a good scrub belonged to Colin. 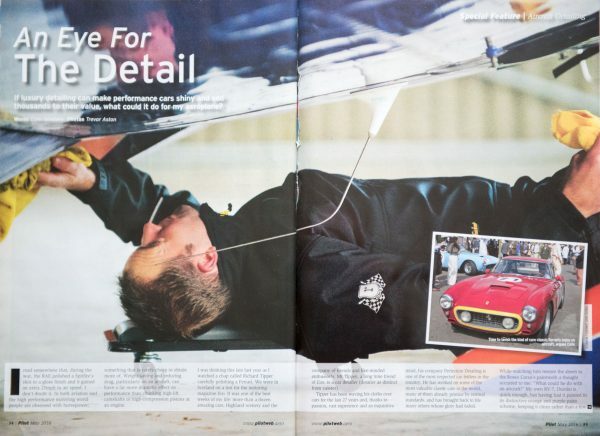 ‘Detailing’ was a new concept to me; very thorough, but careful cleaning, usually of classic or performance cars. My car gets a clean once a year if it’s lucky, usually because it’s so dirty I’m having trouble spotting it against the earth, or because there are toadstools growing in the filthy carpet. 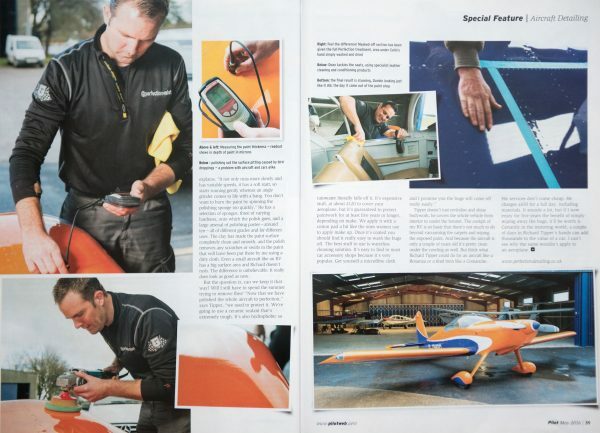 So Richard Tipper’s business, ‘Perfection Detailers’ operates on an entirely elevated plane. Sorry, plain. It’s not just a quick hose-down, and a rub with a good chamois leather. Because ‘perfection’ is what Richard aims for. A vehicle isn’t done until it’s ready to enter a concours d’elegance, in fact it isn’t done until it’s ready to win it. The propeller alone cost nearly £6000, so Colin says he looks after it very carefully! I’d imagine that to most owners, their light-aircraft is quite precious. The fact that their life is dependent on it is also going to make them quite attentive to its well-being. Well, consider that Colin also built his plane himself, in his garden shed. He must care more than most! The first thing Richard Tipper, and his assistant Dean do is clean off the oil stains along the plane’s belly, using a volatile oil a lot like WD40. Then the whole thing gets a shampoo, not any old shampoo of course, it’s pH-neutral with no added chemicals. He dries it straight away to avoid watermarks, using a man-made fabric which he knows from experience to be more absorbent than a chamois. The real challenge is the build-up of splattered insects on the leading edges of the wings and propeller. “It only takes a few minutes in the summer for the wings to look like a Jackson Pollock.” Is how Colin describes it. Elbow grease alone isn’t going to shift them, but before Richard sets about it with his powered polisher he test the thickness of the paint. Only 30-40 microns thick, about a third that of a modern car. He also tests the polish to make sure it doesn’t lift any colour. I learned a lot during my day White Waltham airfield, photography takes you to interesting places, and lets you glance inside other worlds. You can be sure that my car is now…. still waiting to be cleaned. 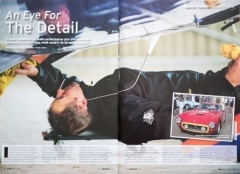 Colin’s article took up 3 double-page spreads in Pilot magazine.